Our riders have a lot of fun, but they’re also working on important life skills. Some need muscle tone or balance. Others gain verbal and social skills. Every rider leaves with new self-confidence, horsemanship skills, and new friends. In a recent semester, a child who had not spoken began talking. One boy caught a ball for the first time. Another gained social and verbal skills that enabled him to get a first job. Every victory is celebrated by the rider and also our staff. 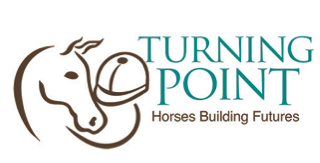 To learn how to enroll your rider in the Turning Point Ranch program, please contact info@turningpointriding.org. The benefits of therapeutic riding apply to many diagnoses. Individuals on the autism spectrum may increase focus and the ability to bond with an animal. Those with neural disorders or brain injuries may increase the ability to plan reactions and use limbs with greater control. Individuals with mobility issues are likely to increase core strength and gait control. Riders with processing delays will develop horsemanship skills and the ability to execute multi step actions involving a horse. Every rider will gain social skills, self-confidence and progress towards independence.